… a memory for Mother’s Day. It would be so easy to cheat this year. So easy to repost my Mother’s Day blog from last year. The list of things that my funny, wonderful, utterly eccentric mum has done and will (I hope) continue to do. But I won’t cheat. That post will stay nestled away in my archives waiting for a time where I am too tired or uninspired or homesick to write something new. I’m sick, lying curled up in bed in the small room at the front of the house. It is my room, with Paddington Bear on the walls and Mr Men on the lamp shade and thick curtains to block out the sun. In a few years, stuffed toys will give way to posters of impossible girls as my brother takes over, needing to escape the sisters that bookend him in our family tree. In a few decades more, as we desert the nest, mum will create an office full of books and model cars and a whirring, over-used computer with a cluttered desktop. But right now it is my room, and I am snuggled in the single bed that is far too big for me. One of the ‘nothers’ – the collective noun I give my siblings. My mum’s hand pauses slightly at the noise, then carries on gently stroking the tangle of hair that has flopped on to my burning forehead. I am staring at the picture that hangs on the wall, a view of fields through a window. 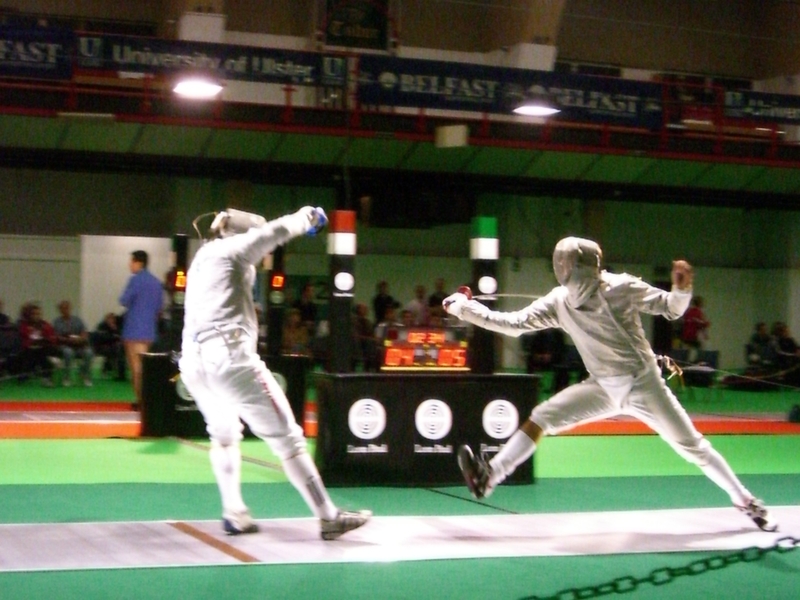 It is the frame, really that I am gazing at. Thick wood, it seems big for such a small picture. I can’t tell if it is my brother or my sister trying to break into the cocoon of comfort wrapped around me. It doesn’t matter. The Little Grey Rabbit book we have just finished reading is on the chair next to my bed, next to my snowman who always stands guard over my sleep. I have Poppy clutched to me with one arm, the white dots on her red dress swimming as I begin to drift. My free hand is running along the soft green blanket with the family of ducks on it, untangling the green and white tassels, trying to separate the colours and then knotting them back together. 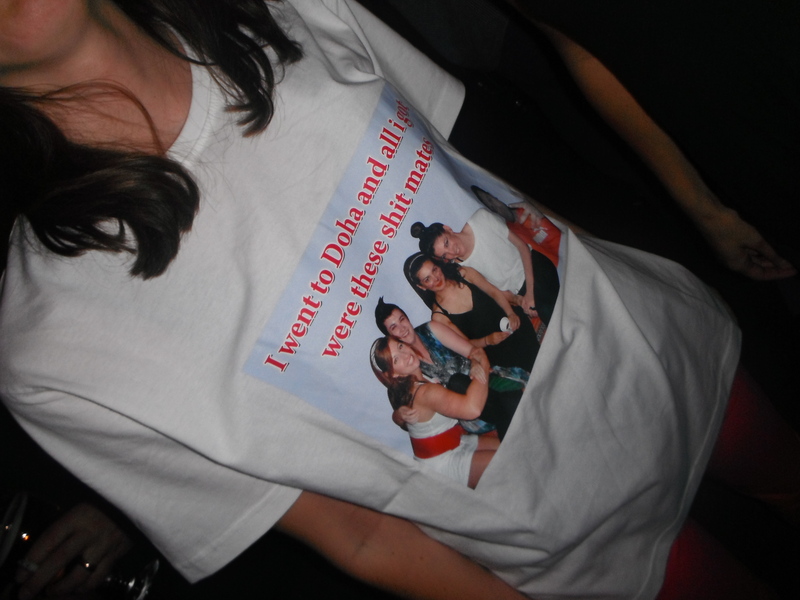 In twenty years or so I will nearly cry when she returns it without a word just days before I fly away. Mum shifts from where she is lying, facing me, wrapping me up in her softness. The mattress lifts as she stands up and suddenly there is too much space in my bed and I’m breathing in the cold air of the room instead of her warmth. I feel lost, rather than angry, now that her attention has been stolen away from me. She walks softly to the door, dims the light until there is barely an orange glow illuminating the adventures of the bear from darkest Peru on my walls. The mattress squeaks in the new-found silence as she lies back down, a barrier between me and the world. Anyway, that aside, I decided it was high time I wrote about Qatar again, what with it being where I live and all. There is a backing track to most conversations you have with new acquaintances in Doha. It’s an easy conversation starter. It is also a pretty safe bet as far as opinions go – all the cool kids hate on Doha. The speaker is usually standing in a five-star hotel, wafting around an over-priced drink. Or dressed as a pirate/ninja/fairy tale character in the large kitchen of a relative stranger’s home surrounded by coolers full of alcohol. We’ve all heard it. Most of us have said it, including me. In fact, given my current lethargic state I am probably more guilty than most of tarring Qatar with the ‘boring’ brush. But here’s the thing. It isn’t. It isn’t boring. It isn’t dull. Granted, it isn’t a city of culture either. You can’t wander around and marvel at the history as revealed to you by enthralling architecture through the ages. Up until the 1940s the place had a population of about 12,000 and everyone lived in tents so it doesn’t exactly lend itself to having a wealth of shared culture and learning. What it does have, though, is a lot of people who are trying, trying, trying every day to make it great. From house parties that transform homes into jungles, circuses, beaches, to plays and events and stand-up comedy. Everyone brings something to this supposedly boring city. So what, in the past 18 sun-drenched months have I done in Doha. I asked myself this yesterday as I was lying by the pool reading. Well, there’s that for a start. But there are so many other things as well. 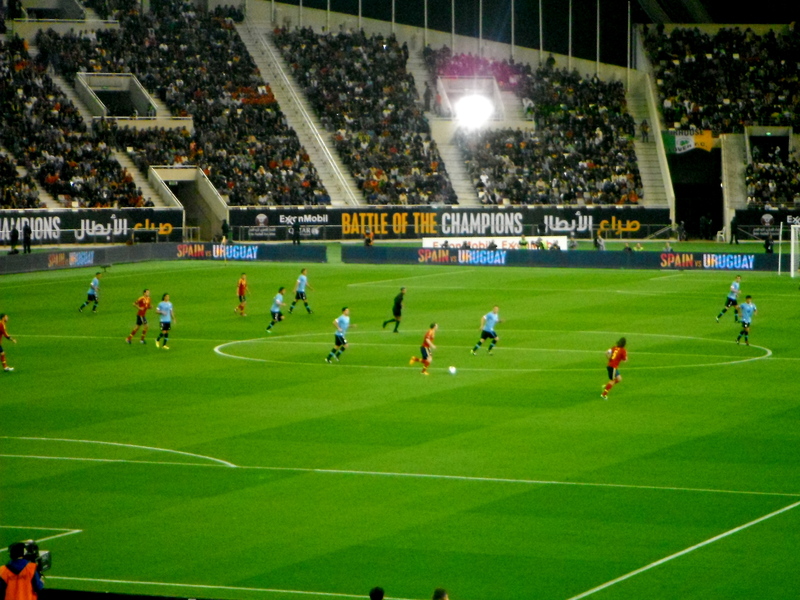 Spain vs Uruguay at Khalifa stadium. The top female tennis players of our time were here last month, battling it out until Serena Williams got beaten. Golfers rocked up to the Qatar Masters and Chris Wood eagled the 18th to win. Spain played Uruguay in Khalifa stadium and if you forget the queuing, lack of food, and pubescent squealing behind us, when else am I going to see a bunch of Spanish first team players running around in shorts? I miss live music, I really, really do. But, (The Killers aside, shut up) I’ve always had specific taste in music. Not limited, I’m generally speaking quite eclectic, but the UK would never have seen me at Calvin Harris one month, and The Commitments the next. I also got to see Wynton Marsalis live, which was pretty f-ing epic. 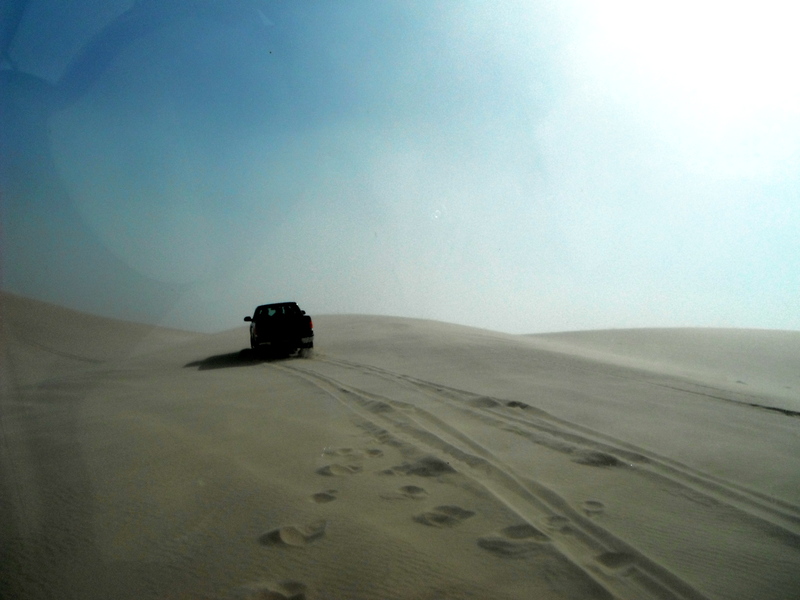 Dune-bashing on one of my first weekends in Doha. 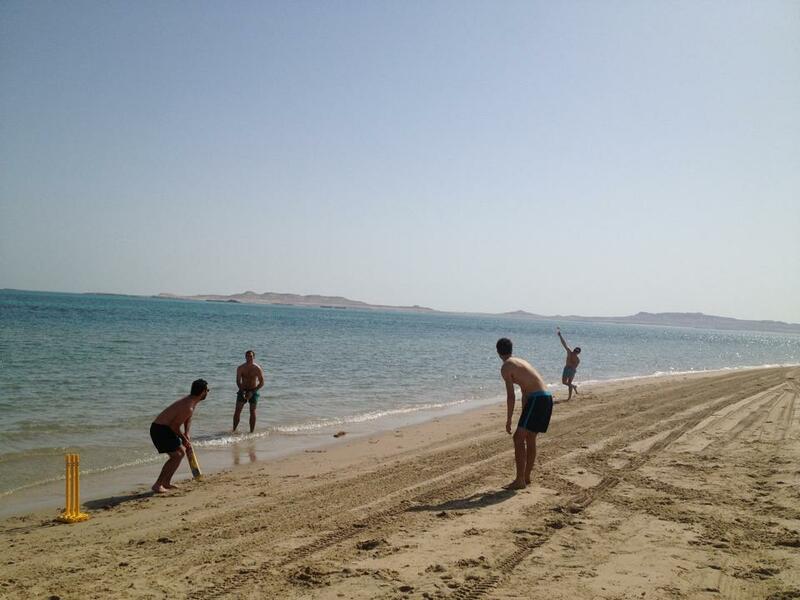 In January I was making use of the best Christmas present a girl could get and using my beach cricket by the inland sea. It was about 27 degrees and glorious. In December it was still warm enough to go to the desert and lie out under the stars for a meteor shower. Don’t get me wrong, for four months of the year when the temperatures start to rocket all I want to do is sit in a bath of ice, whimpering quietly, but when the weather is good it is oh so good. The desert itself clears my mind every time I go and it, alone, is enough to let me forget that I live in a city under construction. 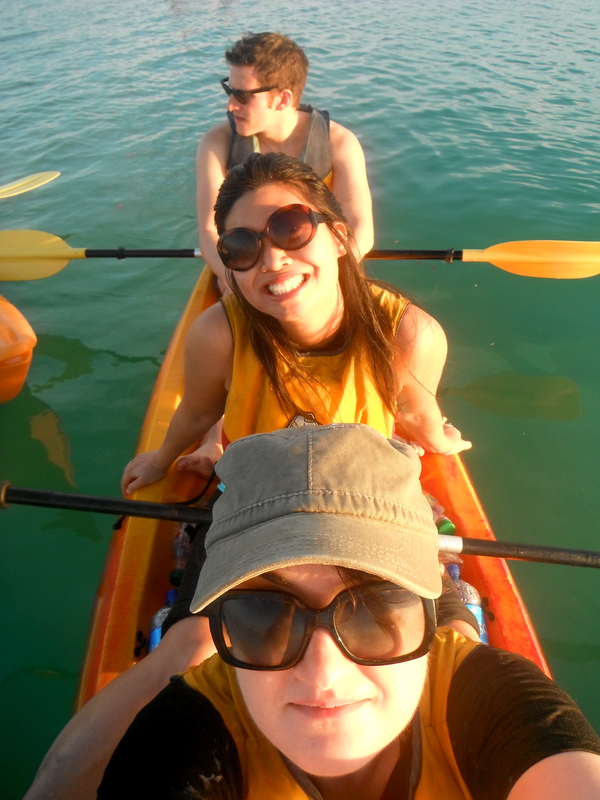 Kayaking in Al Khor’s mangroves. There were flamingoes, and lots of clay. Beyond the desert and out of Doha to Al Khor, we discovered kayaking through the mangroves, an island of flamingoes, and general wonderfulness was available on our doorstep. This is probably one of my favourite things about Doha. I mean… just… gah. Words fail me. There are more things than the list above, two events in particular spring to mind and then jump up and down on a little trampoline vying for attention, but my total lack of self-editing ability means I will have to save them for another post. And so, despite everything; the visa debacle, the constant construction noise that has pounded its way through my life and into my dreams, the dust, that time I got hit by a land cruiser, the rampant weirdness, I just don’t hate Doha. I don’t like cricket, I love it. In lieu of being able to think of anything interesting to say beyond ranting about work visa woe (which I’m sure everyone is sick of hearing about), I thought I would pull something else out the archives of my now defunct blog. Following on from the Beirut post, I’m continuing the travel theme and putting up something from last year about a trip I took to Jordan with a friend from home. The below was originally in two parts and put up around mid-June 2012. It is pretty long as one post so I’ve put in dividing lines to show where the original broke off, just in case you got tired of my rambling and needed a break. 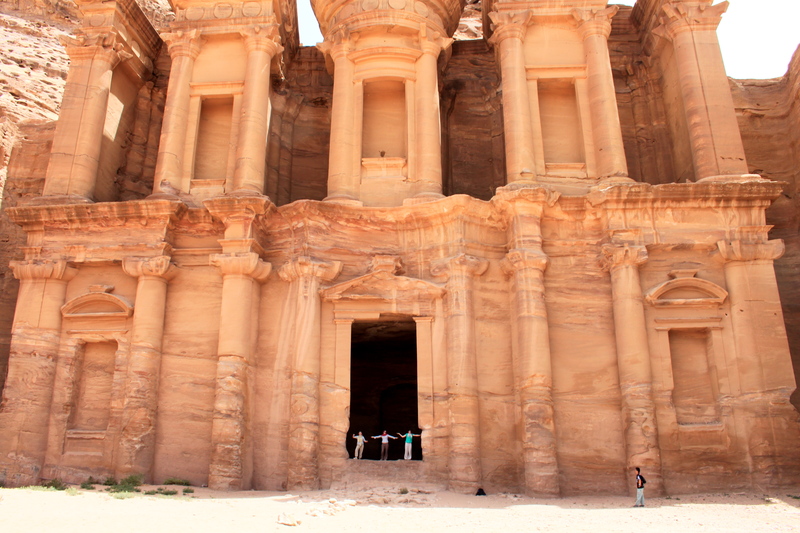 …AKA reflections on a whistle-stop tour of Jordan. I started this post on my final day in Jordan, scribbling frantically in a notebook as I desperately tried to recall all the funny/stupid/exciting things that had happened. As always, my natural procrastinator came to the fore each evening and actually recording the events of the day fell by the wayside and preference was given to napping/ eating/ generally mooching about wherever we were at the time. I justified this by saying I was taking in life and sounds and smells of the place, in all honesty I’m just kind of lazy. Let’s start at the end. That seems logical. On my final day, after a wander around and a small but inevitable adventure due to getting lost thanks to my total lack of a sense of direction, I de-camped in what was clearly the cool indie-kid coffee shop in Rainbow Street, Amman. Called the Green Turtle, it was obviously the student hang-out of choice and a far cry from the little street stalls with their disproportionately large tea urns that we had been buying our regular tea infusions from over the past few days. I chose it because I needed time to sit in peace, and it was far removed from the hustle, honking and constant cries of “welcome in Jordan” that had punctuated much of our journey and in particular that part of it that had been in Amman. These noises were far from unwelcome (for the most part), especially to me coming as I was from Doha, where you get very little street life unless you make an effort to seek it out. It was refreshing to see and hear the sights and sounds of city thriving and full of people going about their lives. Before Amman, Lucie and I had very much done the tourist trail. This is not the normal travelling style for either of us, but we were pressed for time and driven by a compulsion to see everything this amazing country had to offer which meant we had to indulge in a certain amount of taxi tourism. I landed ahead of Lucie and spent a fun hour or so playing the game of “find your bag in amongst the massive pile of suitcases we have just dumped in the middle of the floor.” After a mild panic and an hour wait, I headed to Madaba complete with pack and traveling companion. After the first shawarma of the trip and me getting over the shock that places other than five star hotels sold alcohol, we crashed out in our first of many budget, but pleasant, hotels. After Bethany we visited the Dead Sea (weird, floaty, therapeutic mud – GO THERE) where you can either buy the good mud or elect to dig through sand to get your own. We chose the digging, largely because it was more fun rather than because of the cost. Folowed b some hot waterfalls (Ma’In hot springs) which were weird but very relaxing, if being hammered with a torrent of 40 degree water is your thing, it certainly helped clean all the salt of my hardy underwater camera that survived being in the Dead Sea, before wending our weary way home. The view from the Ma’in hot springs. All this was to the accompaniment of our initially friendly but quickly crossing into creepy taxi driver who’s line of questioning about whether we would like a bedouin husband resulted in some hastily created fiancés. This did not prevent him making vastly inappropriate offers to Lucie while I was out of ear shot. After a quick nap we headed into Madaba to find some food and ended up at a restaurant I have forgotten the name of but will find out soon and put in here. Anyway, I would heartily recommend it for quality, quantity and speed. Also, nom. Walking back through the town proved an interesting experience as two late adolescent/ early 20s boys with hair and clothing similar to that of a T-Bird (always a good look when you can see your own face in someone’s hair) decided a legitimate chat up technique was to follow us around the streets saying “Hi” at increasing volume until they screamed it and then started the whole process over again. That aside, Madaba seemed lovely. Day two saw a rapid fire change of plans. We had intended to head to the Dana nature reserve so I could see nature as opposed to the constant beige I currently live with but were informed by some friendly French Canadians that this would mean missing Petra by candlelight that evening. Having decided we didn’t want to miss it, we threw in our lot with the aforementioned Canadians and two girls from NIR and hopped in a mini bus to Petra. Unfortunately Mr Creepy from the day before was our driver and we spent a rather uncomfortable trip moving Lucie from seat to seat after every stop, only to have the rear view mirror change position accordingly. 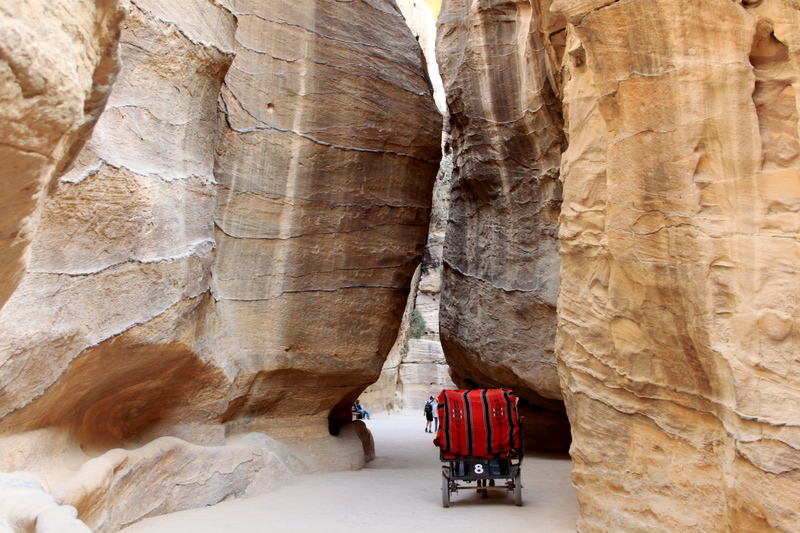 That, and my new-found role of body blocker, aside, we had a stunning roadtrip to Petra, stopping along the King’s Highway to take in the rocky mountains and bedouin camps that make up Jordan’s landscape. 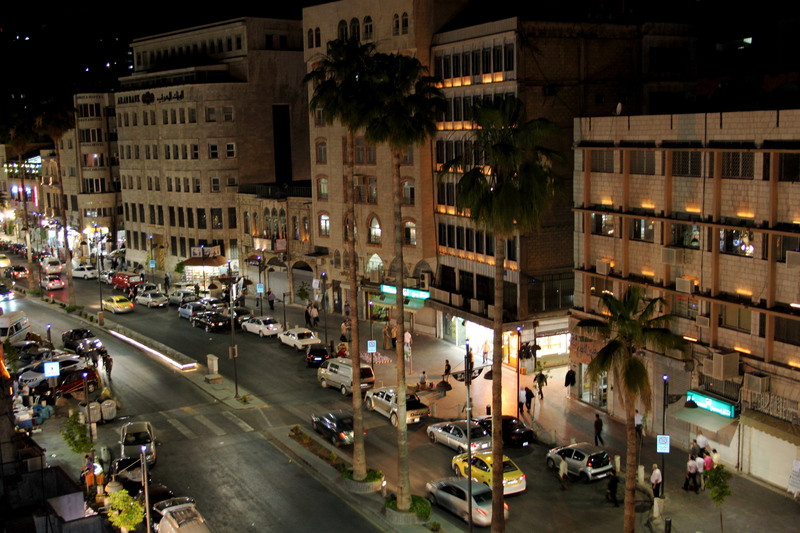 I don’t know if it is because I was coming from the flat, sandy, steel and glass sights of Doha, but Jordan seemed like another world. Its mountains seemed unreal in their size and dominance, like they had been dropped there rather than formed over millennia. The only real down side was when my rather wonderful traveling hat got blown off my head, down a mountain, and is now no doubt making a very fashionable goat the envy of all its friends. Or lunch. 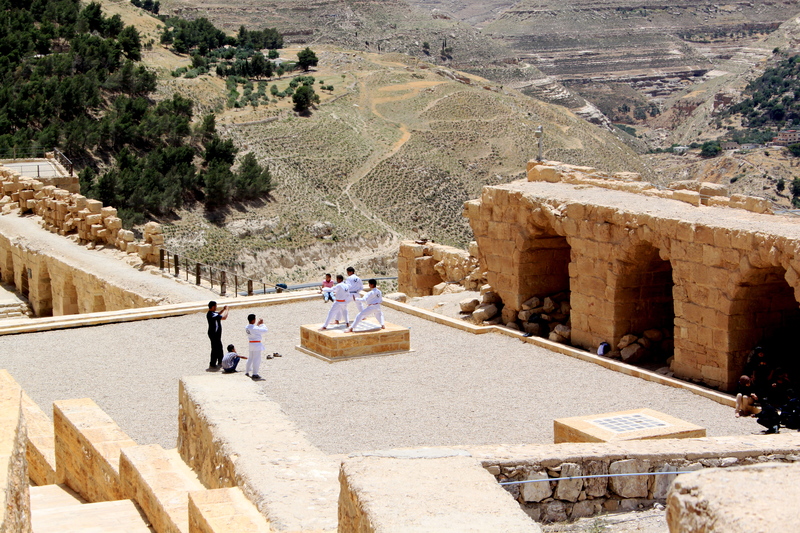 Martial arts at Karak Castle. A stop at Karak castle, a crusader ruin that we got lost in and meandered around for an hour, followed by an odd lunch of unidentifiable meat substances, and we arrived in Petra at about 6pm, rapidly dumping out stuff at CleoPetra (hee hee) in the village outside the place itself, we had a rushed dinner in which I managed an actual conversation in Arabic, with only a few misunderstandings and then headed to Petra by Candlelight, a magical evening of mystery performed three times a week and using 1,000 candles a time. I sound cynical, because I am, but it was undeniably stunning. 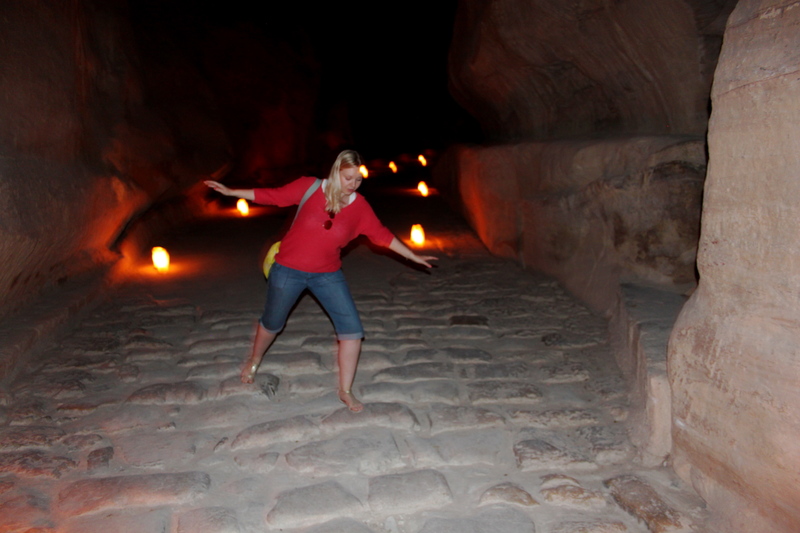 On the advice of a guide, we hung back from the crowd and made our way down the candlelit path in relative silence. The crescent moon hanging above us did not shed enough light to indicate the vast scale of the rocks we were walking through, something that we only realised on re-visiting the site the next day. and so Harrison Forded our way across cobbles and rocks, singing the theme tune and ruining a couple’s romantic time-lapse photograph in the process. On reaching the treasury, we were treated to a candlelit musical display and some stories about the people who had once inhabited the caves of Petra. Lucie was treated to a delightful offer of going to sit in the shadows with someone we had never seen before, and I was treated to a cat running over my lap ruining a serene moment and forcing me to suppress a girly scream. Petra by candlelight ends with a musical performance. A quick kip in another surprisingly pleasant and accommodating hotel (would recommend CleoPetra and the friendliest hotelier in the world) and we were up again to see Petra by day. Stay tuned for the next installment of my random stream on consciousness for stories about donkeys, run away camels, weeing in the desert, bedouin husband #457, Welcome in Jordan, genteel hitchhiking and fun with Mormons. PS – If anyone goes to Jordan, please bring back several hundred packets of “Hello Panda” a biscuity, chocolatey treat. I should probably preface this with an explanation as to why the second installment of the trip has taken so long in the writing. Not in a major “spending weeks in traction and nearly dying” way, but the resulting broken ribs and associated painkillers have left me pretty dazed and confused for the past few weeks. It was enough of an effort to get to work in the morning and stay awake throughout the day. Now on the mend and ignoring the minor distraction of having itching bones, my focus has returned to its previous state. Admittedly, this is only slightly above the attention span of a squirrel that has just discovered espresso, but still, progress. And so back to Jordan. Safe and sound and slightly jaded we checked in to CleoPetra and offloaded our packs before heading to a cafe where I managed a semi-passable conversation in Arabic which resulted in food and coffee and me accidentally saying Petra was a camel instead of beautiful. Fed and watered we headed to Petra by candlelight, the reason for our sudden change of plans. It was stunning. The brightness of the moon and the thousands of candles used to light the path down the Siq to the treasury reflected each other, bathing our path in a silvery, flickering glow. Naturally we spent quite a large portion of this magical experience singing the Indiana Jones theme tune (the opening scenes were shot there) and pretending to be avoiding booby traps. The next day we headed to Petra again, and the full scale of the carved-out rocks we had been walking between the night before was revealed. It is a truly breathtaking place. I’m not going to go through its whole history, which we learnt from a friendly tour guide who made me an offer of clubbing in Aqaba I was only too happy to refuse, but I would recommend people have a read about it online, it is a fascinating place. Also, there are a surprising number of rocks that look like elephants. After the tour was completed, the six of us (dubbed “team pervy bus”) elected to climb the 800-odd steps to the monastery. Being the intelligent souls we so obviously are we started this ascent at about 11am, timing it perfectly with the mid day sun. This combined with my “I’m in a real environment with clean air and stuff” cold meant that the trip up was long and hot, but worth it. Regular breaks were no hardship as I gazed around at the mountains surrounding me. I think the reason I fell so heavily in love with Jordan’s topography is because it contrasts so strongly with my current location. Qatar’s highest natural point is Qurayn Abu al Bawl at 338 feet, whereas its tallest building is more than 980 feet. 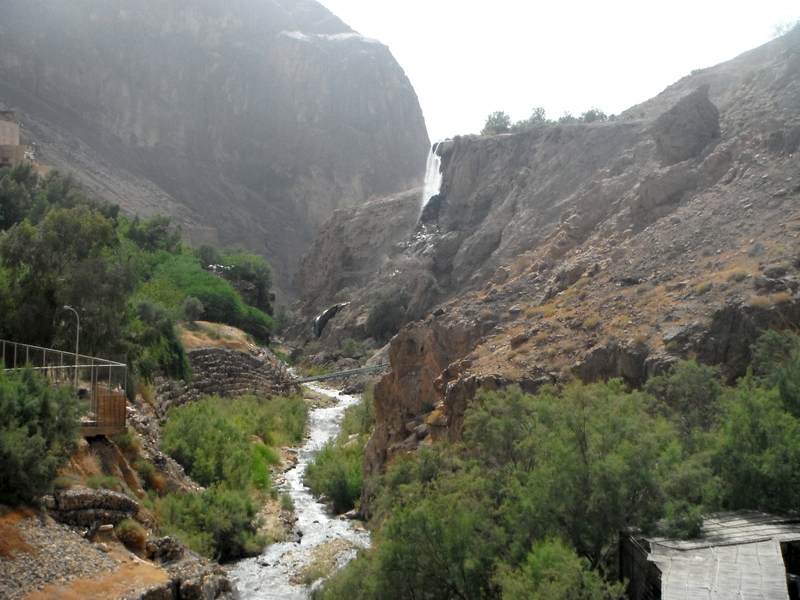 Jordan has rolling mountains, greenery, natural flowing water. Bedouin camps spring up everywhere and the country feels as though it manages to combine the tourist trail, modern city living and traditional lifestyles with far more ease and success than the Gulf countries I have visited or lived in. So we climbed, ate lunch in the blessed shade provided by being hoisted up into the monastery and meandered back down the mountain, re-assuring people as they climbed that it was definitely worth the hike. Here team pervy-bus parted ways. Lucie and I were on a tight schedule and needed to make our desert camp in wadi Rum before sunset whereas the others had an extra day to spend marveling at the wonders of Petra. This marks the only disappointing part of the trip. For both of us, previous experiences of desert camps have involved being miles from anywhere with a fire, a tent and some camels. We were both excited to have this amazing experience in a desert immortalised in Lawrence of Arabia and with dunes and features that make Qatar’s desert seem like the dunes in Cornwall. Instead we arrived at a collection of barrack-looking buildings that put me in mind of my time in Camp Bastion. There was no campfire and rather too many 4x4s parked behind the semi-permanent structures that made up our sleeping and eating quarters. The only other people at the camp (apart from the Jordanian operators and guides) were a group of Americans who seemed reluctant to join in with our obviously hilarious observations about life, the universe, and everything, and two Japanese girls, neither of whom spoke English. Determined not to let the disappointment mar the whole evening, we went for a walk with one of the young Jordanian guys running the camp who told us about the rocks surrounding us and the unlikely speed with which he and his father could climb them. We also sat in the sand, burying our hands and feel until they reached the cool sand under the surface. After tea, which consisted of chicken cooked under the sand, and some musical entertainment during which Lucie caught the eye of Bedouin husband #457 by committing the obvious come on of “having a nice time” we sat out in the dark and star gazed while chatting about various euphemisms for needing the lavatory. As you do. This fun time was marred slightly by the sounds of a real-life bedouin topping up his mobile phone and by the arrival of husband #457 who proceeded to attempt touching but who then went away after being told that this was not considered acceptable behaviour. So we star gazed and then went to sleep and in the morning got on our camels and left. 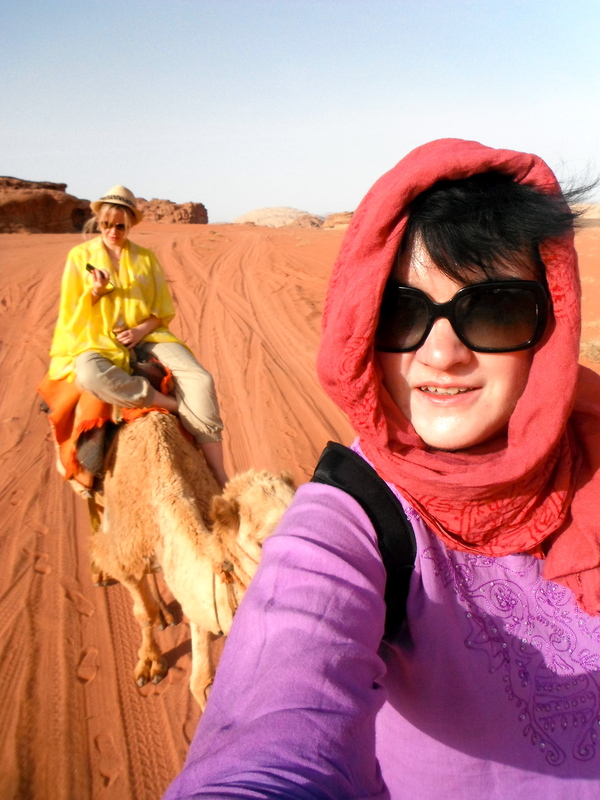 out of Petra, we had established that Lucie was not a natural-born rider but the Sudanese guide seemed happy to let me take control of the camels, which were looped together as he walked beside us asking us to explain the meanings of various rap lyrics. He also asked us to conjugate the verb “to arrest,” which wasn’t exactly what I thought I would be doing on the back of a camel in Wadi Rum, but we rolled with it. A small moment of panic when my camel tried to run away from Lucie’s camel despite the fact they were tied together, and a small detour so they could go and look at some lady camels and we were back in Rum with no means of transportation. The main travel hub consisted of a cafe with several long benches outside where tour groups and individual travelers congregated. Some very genteel hitchhiking resulted in us getting a lift to Aqaba from some Belgians in a Mazda. Aqaba was humid and a bit grimy. I have heard very positive things about the place, but at the time we arrived it struck me as a seaside tourist resort that was struggling in the off-season. After a bizarre taxi ride to a resort that had a pool that wasn’t open and a manager who couldn’t grasp the fact that the fact it would be open tomorrow wasn’t much good to us, we hitched a ride back into town with a man called Charles who turned out to be a Mormon. The weirdness continued back in town we had fish and chips, which originally came on one plate before we specified we did, in fact, want two meals. Eventually we struck gold after the dust of the desert and found a pool with a never-used water slide and some guys who brought us tea. After a refreshing afternoon of not doing much, we called Charles and hitched to Amman with him and his lovely Mormon friends, who didn’t try to convert us once and were basically delightful. On the journey down we booked a room in a cheap place recommended by both guidebooks and after dumping our stuff and a quick nap we headed out to explore the city. And it was a real city. I genuinely love some things about Doha and the area in which I live but one thing I don’t like is the lack of normal street life. People walking around, people with stalls and tea stands and selling a plethora of amazingly coloured spices. This was all going on in Amman. I also miss being able to go somewhere selling food on the street and get a plate of whatever they have that day for the equivalent of a few pence. All this was going on, and I reveled in the life and the sounds of the city. After our explore, we crashed out and the next (and final full day) we went to an hammam and got all cleanified (which is a word) and relaxed. We also hit the gold souq and bargained for jewelry, which was excellent fun. 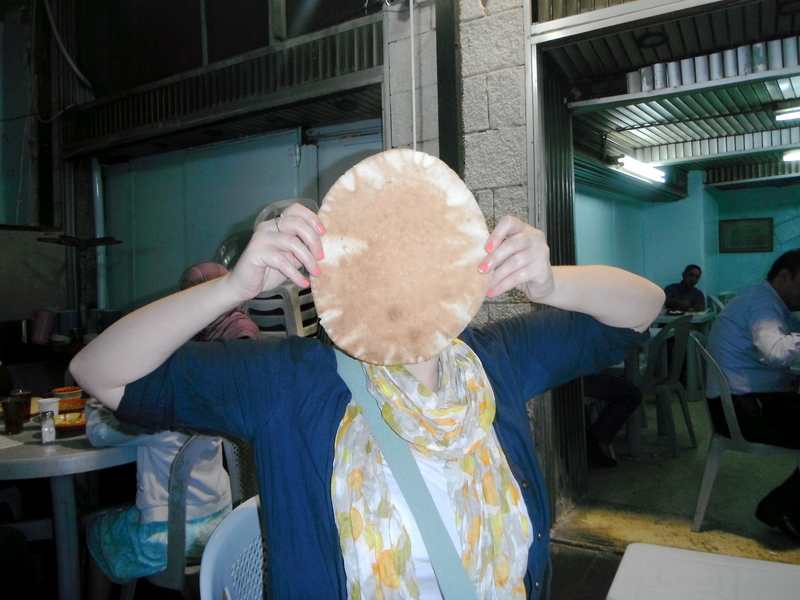 Another meal, this time involving pitta bread bigger than our faces and another night and Lucie was up at O’Christ hundred hours to get a flight and I was left with a day of meandering, in which I took in a few of the touristy sites in Amman. The museums, the ruins and other bits and bobs in the city are perfectly pleasant, but Amman for me was more about experiencing the life and the noise. So that takes us full circle. A quick three days in Dubai and I was back in Doha, back in the portacabin and back to planning my next trip out.